Israel Shipyards will introduce coastal defense systems for short- and long-distance protection, developed to prevent illegal activity and maritime terrorism, provide coastal protection for Naval forces, and protect territorial waters and EEZs. The company will present a range of vessels and combat-proven solutions, including SHALDAG Fast Patrol Craft and OPVs with a high level of maneuverability. Among the solutions installed on these vessels are cutting-edge weapon systems as well as command and control, electro-optics, and night vision systems. The company will showcase two models of the Fast Patrol Craft (FPC) family – the SHALDAG MK II and SHALDAG MK V. Both FPCs are made of aluminum and driven by water jet, with a speed of above 40 knots even in rough seas. They provide outstanding maneuverability and minimal draft, enabling operation in shallow waters. The SHALDAG MK II is designed for coastal protection as well as for rivers, while the SHALDAG MK V is, among other things, designed for Exclusive Economic Zone (EEZ) protection missions. The company will also showcase the most advanced and cost-effective OPV available. Designed mainly for coastal protection, drilling rigs, and offshore facilities, they have variety of remotely controlled and stabilized armament systems. With a hull made of steel and a superstructure of aluminum, the vessel sails at high speeds (above 32 knots). Weapon control stations and navigation systems are installed on the command bridge, enabling the ship’s commander to have centralized control from the bridge. A helipad is also optional. 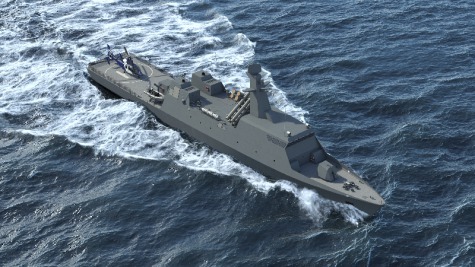 This multi-mission vessel, in a Corvette configuration, is modularly designed for use in naval warfare or as an OPV. When used as an OPV, it can be provided with lighter weaponry. The SAAR S-72 utilizes hybrid propulsion, automatically switching to diesel upon acceleration. It is designed for Search and Rescue and open sea patrol and surveillance, as well as protection of maritime sovereignty and offshore facilities. Israel Shipyards Ltd. is one of the largest privately-owned shipbuilding and repair facilities in the Eastern Mediterranean. The manufacturing and repair plant is spread over 330,000 sq. meters with 45,000 sq. meters of under-roof facilities and a wharf length of 900 meters. Israel Shipyards operates a Syncrolift with 3,600 tons of lifting capacity and has a total berthing area length of 1000 meters with 12 meters of water depth.